A leaked internal document from the New York State Department of Transportation gives warning of road damage due to heavy truck use that comes with hydrofracking. The document, dated June 22, is a draft version of a discussion paper titled “Transportation impacts of potential Marcellus Shale gas development.” It estimated $121 - $222 million of damage to local roads from heavy truck use. The draft appeared last week on the Chenango, Delaware and Ostego Gas Drilling Opposition Group website. The ordinance was drafted in consultation with the Community Environmental Legal Defense Fund (CELDF) and advocated by the community group Protecting Our Water Rights (POWR). Two key prohibitions are enacted to protect the rights enumerated. The ordinance bans “any individual or corporation to engage in the extraction of natural gas or oil utilizing in whole or in part the process commonly known as and herein defined as hydraulic fracturing” and also prohibits “any individual or corporation to engage in the extraction of natural gas or oil utilizing in whole or in part the process commonly known as horizontal gas well drilling,” with the exception, in each case, of gas wells installed and operating at the time of enactment of the ordinance. A leaked internal New York State Department of Transportation document suggests that the state is not ready for an estimated increase of up to 1.5 million heavy truck trips per year that could result from natural gas drilling in the Marcellus Shale. The cost of the increased heavy traffic could result in the need for repairs and reconstruction ranging from $211 million to $378 million annually, the document states. "It will be necessary to reconstruct hundreds of miles of roads and scores of bridges and undertake safety and operational improvements in many areas" where Marcellus Shale drilling is expected to take place, it states. The effects of shale gas drilling operations on roadways are well-known in other states, such as Pennsylvania, and energy companies have said they repair any damages they cause. With all of the focus on the vast natural gas reserve that is the Marcellus Shale, a company has applied for a permit to drill into the Utica Shale, a rock layer that expands past the Marcellus and covers even more of New York state. Norse Energy, a Norwegian company whose U.S. headquarters are in the Buffalo area, has applied for a horizontal high-volume hydraulic fracturing permit in Chenango County, hoping to tap into the Utica, according to the Press & Sun-Bulletin and various other reports. The permit application targeting the Utica is the first of its kind in New York, and may bring the debate over hydrofracking—the controversial gas stimulation technique—to more parts of the state. Here’s a map of New York’s portion of the Utica formation. “Our experts believe that New York’s Utica has even more potential than the Marcellus and that it could rival what’s being experienced right now in Pennsylvania with the Marcellus,” Norse Executive Vice President Dennis Holbrook told the Press & Sun-Bulletin’s Steve Reilly. Few words stir up passion and polarization like sustainability. The EPA offers up this description. "The traditional definition of sustainability calls for policies and strategies that meet society’s present needs without compromising the ability of future generations to meet their own needs." Gee, who could disagree with such touchy and feely sentiments? The answer is always in the details and when you strip away the platitudes, what remains is a coordinated plot to enslave humanity under a burden of a Carbon Tax scheme. The environment has more risk from globalist central planning than from any fossil fuel emissions. Proponents of the global warming religion demonstrate a disdain for rational thinking that challenges their doctrine of a heterodox belief. The sustainability cult ignores any evidence that conflicts with their political agenda. The accomplished author Robert Bryce cites in Forbes, A New Study Takes The Wind Out Of Wind Energy. "For years, it's been an article of faith among advocates of renewables that increased use of wind energy can provide a cost-effective method of reducing carbon dioxide emissions. The reality: wind energy's carbon dioxide-cutting benefits are vastly overstated. But if wind energy doesn't significantly reduce carbon dioxide emissions, then critics can easily challenge the industry's hefty subsidies, which include the federal production tax credit of $0.022 for each kilowatt-hour of electricity. That amounts to a subsidy of $6.44 per million BTU of energy produced. For comparison, in 2008, the Energy Information Administration reported that subsidies to the oil and gas sector totaled $1.9 billion per year, or about $0.03 per million BTU of energy produced. In other words, subsidies to the wind sector are more than 200 times as great as those given to the oil and gas sector on the basis of per-unit-of-energy produced. If those fat subsidies go away, then the U.S. wind sector will be stopped dead in its tracks. And for consumers, that should be welcome news." Local law may prohibit hydraulic fracturing for a year while the community assesses the impacts. A one-year moratorium on the process commonly known as hydrofracking was discussed at a special town board meeting last Thursday in Alfred. The board had a draft for local law which looks to protect the town from various effects of this industry, which could have a vast impact on the agricultural area. The board will be meeting with David Slottje, an Ithaca-based lawyer, on August 18 to finalize the draft for local law. Fion MacCrea, council member, said this yearlong moratorium would allow time to see what will happen with the Department of Environmental Conservation’s regulations regarding hydrofracking. Our NYPA correspondents report that C.E.O. Richie Kessel rarely shows up for work at his White Plains office. On the average, his office appearances are often limited to two half days a week. The rest of the work week he spends flitting around Long Island and New York City going to luncheons, giving speeches and receiving vanity honors. Dining plays a very important and expensive role in the lives of Kessel and the hacks on his senior staff. For instance, NYPA employees have been ordered to pick up food from Manhattan’s Carnegie Deli and from one of Kessel’s favorite Long Island Chinese restaurants to feed Kessel and senior staff at his White Plain’s Executive Management Committee meetings. In these difficult economic times, it is an outrage that ratepayers’ hard-earned dollars are being wasted on NYPA employees traveling all over the metropolitan region to procure chow for Kessel and his hacks. As discussion intensifies about drilling for natural gas in the Marcellus Shale region spanning four eastern states, a major talking point is suitable compensation for the counties and municipalities where drilling takes place. In Pennsylvania, two-thirds of which covers the ancient geological formation that has attracted scores of drilling companies taking advantage of new technology, debate has heated up over whether to impose a tax or severance fee for extracting, or “severing” natural gas from the earth. Pennsylvania is the only major drilling state with no such tax. On Friday, a 30-member shale panel commissioned by Gov. Tom Corbett in March and chaired by Lieut. Gov. Jim Cawley, recommended imposing an impact fee, as opposed to a tax, on drilling companies to offset local infrastructure and environmental costs. In a recent op-ed, Bruce Edelston, executive director of the Coalition for Fair Transmission Policy, warned that electricity prices could become the next flashpoint in the nation's capital if the Federal Energy Regulatory Commission proceeds on July 21 with a transmission proposal that burdens consumers with the costs of new electric facilities from which they receive little or no benefits. "FERC action on cost allocation for new transmission should ensure the lowest reasonable cost to consumers, not the largest possible subsidies to clean energy developers and transmission companies," stated the op-ed in The Hill newspaper, a prominent print and online Washington publication for and about Congress. An earlier FERC order provoked concerns about commission policy. In December, FERC issued an order that socializes the cost of certain new transmission lines across 13 Midwestern states. "Michigan consumers may be the first to experience FERC-approved sticker shock -- a $500 million a year surtax on their utility bills," Edelston wrote. As a result of the order, "Michigan could be forced to pay 20 percent of at least $16 billion for new wind farms in other states that will provide virtually no benefits to Michigan consumers," the op-ed stated. 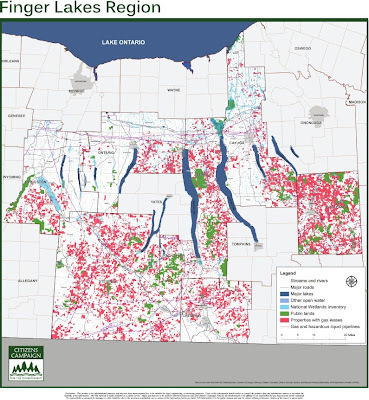 Much of the debate about hydraulic fracturing has focused on the impact that the controversial method of natural gas extraction could have on water quality in upstate New York. Some say, though, that air quality is just as big a concern. Last week, an Albany environmental group focused attention on a citizen-driven study in two western states that found elevated levels of harmful chemicals in the air near gas wells and gas-handling facilities. Based on nine one-time samples collected by residents in Colorado and New Mexico, the study doesn't pretend to be conclusive, but underscores concerns about the impact of gas wells and production facilities on the health of people who live or work near them. "This gives us a clue there's a serious problem," said Barbara Warren, executive director of the Albany-based Citizens Environmental Coalition, who said proposed state guidelines don't appear robust enough. That is the official position of the Committee to Preserve the Finger Lakes as stated on their website, www.preservethefingerlakes.com. An unincorporated, not-for-profit association of unpaid volunteers, the CPFL seeks to be a “super-cooperator” for the public, municipal officials, and action groups to have access to the growing body of evidence of the risks that accompany the potential benefits promoted by the gas drilling industry. In an interview with CPFL Chairman Peter Gamba, and member Joe Hoff, their organization was described as largely comprised of retirees who use their available time, education, and experience to organize the effort to preserve the waters of the Finger Lakes, as well as the rural, agricultural, and recreational atmosphere of the region. When New York state environmental officials released their revised regulatory blueprint for natural gas drilling last week, the tome was 1,095 pages long and covered everything from protecting bird habitats to getting rid of drilling mud. But even as the state moves toward a day when thousands of new gas wells dot the landscape, key decisions are yet to be made — including when the first well might be drilled under the new rules. The Department of Environmental Conservation still must flesh out the regulatory blueprint, solicit public comments and wade through the responses, DEC Commissioner Joe Martens said. "Everyone's been asking when that will be complete. It depends on how many comments we get," Martens said at a meeting Tuesday with the editorial board of the Democrat and Chronicle. "Conceivably we could have this ... finalized early next year. That's my best guess." A Texas-based energy company blanketed Broome and Delaware county landowners with letters bearing an unwelcome piece of news last week. XTO Energy is seeking to forcibly extend oil and gas leases because of long-standing bans on high volume hydraulic fracturing, the company told landowners in "force majeure" letters sent to members of the Deposit Coalition last week. "We didn't like it, (but) it's not a surprise," said Dewey Decker, who led the 500-member coalition when it signed its $110 million deal with XTO in 2008. "We kind of expected it." Signed in May 2008, leases gave landowners $2,411 per acre up front in addition to 15 percent royalties and were originally set to expire after five years. The city of Auburn is banning natural gas-drilling wastewater from its treatment plant. City councilors voted Thursday to stop the city’s practice of accepting the chemical-laced wastewater from hydraulic fracturing of gas wells. The city has been under pressure from the Cayuga Anti-Fracking Alliance to enact the ban. Environmental groups say the wastewater poses a threat to water supplies. They say it contains high concentrations of salt and cancer-causing petroleum agents that the city’s treatment plant isn’t equipped to remove. The city had projected to receive $600,000 over the next year by accepting the waste at its treatment plant. Federal and state regulators permit the city plant to accept and process water from natural gas wells. While the state would try to make sure new natural gas wells in the Marcellus Shale adhere to local laws and zoning ordinances, disputes between municipalities and gas companies would likely be resolved by a court, the state's top environmental regulator predicted Wednesday. In a editorial board meeting Wednesday, Department of Environmental Conservation commissioner Joseph Martens touted his office's latest review of high-volume hydraulic fracturing for natural gas. The report was released last week and is the latest step toward allowing the gas-drilling technique in New York. In its report, the DEC requires natural gas companies to show that any proposed sites for new gas wells are in accordance with municipal laws and ordinances. If it clearly isn't, the DEC could refuse to grant a permit. If a dispute arises, however, it could get dicey. Not all of the negativism directed toward the proposed rules for regulating hydraulic fracturing and horizontal drilling in New York is coming from anti-fracking organizations and individuals. The American Petroleum Institute, a Washington D.C.-based group representing the oil and gas industry, continues to review the 736-page document but has joined environmental groups and others with concerns about pumping huge volumes of chemically laced water into the Marcellus shale formation to release the natural gas trapped in the dense rock. 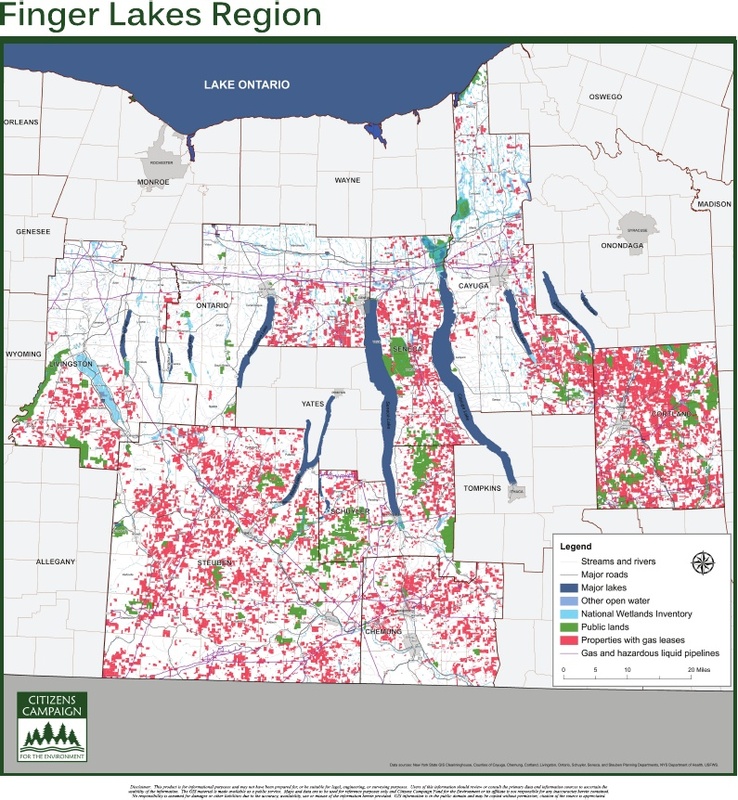 The institute favors fracking/horizontal drilling but says New York's proposal, released Friday, doesn't go far enough to meet the needs of the industry -- particularly the sections that ban drilling on state-owned land and within the watershed areas of New York City and Syracuse. "Ending the moratorium on hydraulic fracturing is hardly great news in the development of one of the world's largest resources of clean-burning natural gas if it still leaves much of the Marcellus Shale region off-limits to responsible development," API President/CEO Jack Gerard said in a statement. The Paleontological Research institution, the curator of fossils and founding organization of Ithaca's Museum of the Earth, has waded into sensitive topics before -- evolution, climate change, the effects of last year's Gulf of Mexico oil spill among others. But now, it's getting involved in the science behind exploration for natural gas in its own back yard, and that can be delicate. After all, scientists are people, too. ""We all have friends across the spectrum," said Robert Ross, PRI's associate director for outreach. "We want to continue conversations with everyone." With a $100,000 grant from the National Science Foundation obtained in May 2010, PRI has begun publishing a series of printed and online primers on the earth science involved in exploration and extraction in the Marcellus shale rock formation beneath much of central New York. The first set was published in May this year. The online versions are at museumoftheearth.org/marcellusshale. More are planned for release starting this summer. Will the DEC report appease anyone? A 900-page revised report Friday detailing New York's plan to deal with the impacts of hydraulic fracturing seeks to thread the needle among emotionally charged advocates for gas companies, property owners and the environment. The report will become the backbone of any future decision to let the much-debated natural gas exploration technique go forward. And it will be the latest test of Gov. Andrew Cuomo's ability to navigate a thorny issue as he seeks to balance the need for economic development upstate and the preservation of the environment. While the state remains at least several months away from being in a position to issue permits for high-volume fracking in the Marcellus Shale formation, Friday's unveiling was a major step toward that day. For the first time, DEC Commissioner Joseph Martens — a former open-space advocate appointed by Cuomo earlier this year — said he's convinced fracking can be done safely, as long as the right safeguards are in place.